I’ll make this brief so we can get to the good stuff, which is Free Seeds. Something happened a couple months ago when I started getting death threats for writing this blog. I had my own “put up or shut up” moment and realized that, in writing here, despite what I’d been telling myself about how this blog was just my hobby, I had accidentally created for myself an awesome job, and I had two choices: quit and lick my wounds because sometimes people are jerks, or respect this gig for what it really is. After the douche-waffle thing, I took a few weeks off and really thought about what the hell I was doing here. In the end I decided that, if the Universe hands you the opportunity for your dream job, you take it and you work hard and you don’t complain. That snapped me out of a kinda anti-consumerist delusion I’d been operating under, this idea that I would be a complete fraud if I got compensated at all for the inordinate time, effort and expense it takes to make this blog happen. So, anyway, long-story-short, now I have a sponsor. No – I have the best sponsor. When you are a little advertising shy like me, it helps when your first and only sponsor is a small, friendly, super-ethical seed house that believes in the exact same things you do. High Mowing Organic Seeds is my new sponsor. They are a 100% organic, GMO-free, farm-based seed house. They are located in Vermont, and grow and trial many of their varieties in-house, but also have partner organic seed growers in Washington, Oregon, Idaho, California, Vermont, and New York. I love them, and here’s why. High Mowing is doing something really important – they are aggressively developing more varieties of seeds that are successful for organic growers. That matters for two reasons. The Selfish Reason – Organic Adaptation: You know how people talk about how heirlooms are awesome because they have become adapted to certain conditions over generations of seed-saving? Well, the organic thing is no different. Seeds grown from organically grown plants carry genetics that make them better adapted to successful organic culture in the garden or in the field. Conventionally grown seeds come from plants that probably grew well with a lot of help from high doses of very strong chemical fertilizers, fungicides and herbicides. But you aren’t growing your veggies that way, so why buy seed that is adapted to that culture when organic seeds are more likely to thrive under the backyard organic conditions you’re providing? That’s just not very comforting, is it? Stuff like this makes me feel like insisting on organic growing methodologies from seed-to-sandwich isn’t nearly so paranoid as it might seem. And that’s where High Mowing comes in. 100% organic seed production means none of their products are part of the problem, and – in fact – by pushing more seed crop land into organic production, supporting their seeds is nudging acreage towards the solution. Okay, back to selfish…High Mowing is starting off their sponsorship here at NW Edible with a bang by giving away one of their 100% Organic Garden Starter Collections to one lucky reader. 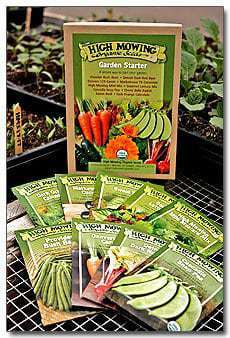 The High Mowing Garden Starter Collection includes 10 seed packets of adaptable, easy-to-grow, organic vegetable varieties (I’ve grown most of these very successfully in the Pac NW) and – bonus!- it comes in a fab, reusable box. This collection is valued at $27.50. One lucky winner will get the whole collection for free. To enter to win, leave a comment on this blog post telling me what vegetable you have the most trouble growing. (Mine is carrots, which is why I am excited to see if this rust fly resistant carrot lives up to the hype.) The winner will be notified by email. Contest open until Thursday, January 9th at 8:00 PM PST. Contest open to US residents only due to shipping regulations. Thank you to High Mowing for sponsoring this giveaway. I encourage you guys to go check out High Mowing and request a free catalog. See if you like what you see. Cukes! I’ve only ever had one year of success, with “success” defined as anything other than one puny green finger surrounded by dead vines. I’m not sure if it’s a new pest/problem every year, but we keep trying different strategies! And there’s always the farmer’s market for unwaxed pickle cukes. I also have a lot of trouble with carrots. I get a few,which are amazing and keep me trying for more. If I win this starter set it will go to my son’s school garden. Thanks! Cauliflower- twice I have succeeded with the most beautiful purple, orange, and white cauliflowers- every other year they have flopped. I can’t figure out what I’ve done differently so I can correct the problem, either. It’s discouraging! I really have trouble with beets. Even after I thin them and keep them covered it just turns out to be nothing. I grew a big one once but it was a happy accident. It grew on it’s own out of my compost pile! Gah! Carrots & zucchini … everything else was awesome, my 1st year so I figured I wouldn’t do so well and was happily surprised. Hoping to be able to help my sister start her garden this year.